Considering the Phillies’ season ended in the NLCS on Saturday night, I can’t make the claim that they were the best team in baseball this season, but I will always believe that they were, and I suspect there are plenty of experts out there that agree with me. That’s what makes it such a disappointing defeat. Even with so much of the current roster under contract for next year, and poised to make another run at a title, there are only so many times that you can say, “We have the best team, and we should win it all this year.” If the Yankees go out and sign Cliff Lee and Jayson Werth this offseason, I’m not sure we can make that claim at any point next season. But even if the Yankees do load up on high-priced reinforcements, the Phils will absolutely be a contender once again. And even if the Yankees do hold the title of “Best Team,” that doesn’t mean they’ll win it all. Phillies fan know that all too well right now. As long as the Phillies have Halladay, Hamels, and Oswalt at the top of their rotation, still in or near their primes, they will be contenders. Those guys came through and did exactly what was expected of them this postseason. The bullpen did even more than was expected, and Lidge and Madson will be back in their same roles next year, as well. The reason the Phillies failed, of course, was that they simply could not hit. They could not push runners across home plate enough. Sometimes complicated games have simple solutions. You can’t win if you don’t score runs. Phillie fans found themselves saying that like a mantra this October. You can’t win if you don’t score runs. And, in the end, they couldn’t do it. What’s the solution? Most fans might not want to hear this right now, but the best solution is really to stay the course. Baseball is an odd sport. Players go through lengthy slumps and even entire seasons where they don’t hit at the level they’re capable of. Not only does this Phillie offense have a track record of success, but they’re also all under contract for next year (excluding Werth). The offense will look very similar next year, and that’s not a bad thing. We’ll all wait and see what happens with Werth. After that performance by the Phillie offense this postseason, it’s tough to think that the guy who was arguably the most productive hitter on the team this season will be leaving. Werth and Ruben Amaro both say there’s a chance he will be re-signed. It seems unlikely, but who knows? Nobody knows where the Phillie organization is willing to go with its payroll. No matter what happens, the Phillies will open the 2011 season as the favorites to win a fifth consecutive division title, and they’ll be looking to advance to the NLCS for the fourth straight year, and to win a third pennant in four seasons. It’s an amazing time to be a Phillie fan, even if it doesn’t feel like it this week. 9:53 AM: The Phils are now 3-0 this postseason when we do a live blog and 1-2 when we don’t, so you know what that means. You can’t say we didn’t do our part. And we’re starting over 10 hours before game time, so that can only help, right? I’ll have my lucky shirt on, too. I’m still debating whether to go with the mask on or off on my Chooch bobble-head, but I’m leaning towards off. 11:03: Extra-base hits have been really hard to come by, but Howard and Werth start off the 8th with back-to-back doubles to tie it! Really impressive to do that off those good relievers. Now we need to get Werth over and get him in. But Rollins pops it up. All these years later, and he still does that WAY too often. Let’s get the Blanton talk out of the way right now. As everyone knows, if the Phils had gone with Halladay on short rest tonight, they would’ve had to also throw Oswalt and Hamels on short rest. The bottom line is, Hamels on short rest is not something they’re willing to consider, so throwing Halladay today makes no sense. Why won’t they throw Hamels on short rest? I’m not sure. Dubee’s reasoning was, “He’s never done it before”, which is not really a valid reason at this point. We’ve been hearing that since the ’08 playoffs. I understand the logic in not wanting him to make his first ever short-rest start in the playoffs, but why not have him throw on short-rest once or twice during the regular season to see how he handles it? Either the Phils’ brass really doesn’t think he can handle it, or he’s told them he doesn’t think he can (wouldn’t put it past him, unfortunately). Anyway, all that is a moot point for this postseason. Again, if they’re not willing to throw Hamels on short rest, Blanton is the right pick for Game 4. 10:06 AM: Everyone agrees that the term “must-win” is over-used in sports, then they go ahead and use it anyway. This is not a must-win. Don’t get me wrong, it’s hugely critical, but do you really think the Phillies can’t possibly win three straight games with the pitchers they have coming? If Halladay could manage a win tomorrow (obviously not far-fetched), then they’d be coming home, with momentum, needing to win just two in a row behind Oswalt and Hamels. Anyone who thinks that’s an impossible scenario is crazy. Is it likely that they’d win those three in a row? Nope. That’s why tonight is so important. 11:21 AM: [Bry, jumping in] You’re right, Doogan, in that the term “must-win is wholly over-used. The only must-wins are elimination games. That being said, being down 2-1 is no fun for the fans. A lot of thoughts at the start of the series have changed and many have not. At the beginning, it was hard for some people to imagine the Giants winning this series at all. That thought is clearly out the window now because they are very much in the series and, though I haven’t checked with Vegas, I would probably handicap this series right now as a pick ’em. So, it’s very much up in the air. I, however (and maybe because of my fatalistic Philadelphianism), gave the Giants a puncher’s chance, at the very least. But, when this series started, I honestly couldn’t imagine a scenario where the Giants would win this series without winning Game Four. That belief has not really changed that much now. If the Phils can win tonight (against a rookie pitcher), they are down to a best-of-three series, with homefield advantage, with all three of the big guys due to pitch, on full rest. So, even with two frustrating losses in this series, the Phils are one win away from regaining the status of “prevailing favorite” again. So, all is not lost. Keep the faith. 1:47 PM: Maybe the key to turning around this series is Chase Utley. What a rough postseason he’s had, getting it started with two throwing errors in Game 1 of the LDS. He has just one single in this series, and he cost the Phils a run last night in what should’ve been ruled an error but was called a single. He also couldn’t come up with a ball to his left that was a legitimate single, but was a ball that Utley often comes up with, and he might’ve been able to get Huff at 1st to save another run. Knowing how intense he is, and how much this all means to him, I wouldn’t be surprised to see him get things going tonight, with the bat and the glove. Chase Utley is not the type of guy that buckles in the face of adversity. The Phils need him to spark the offense. 3:20 PM: [Bry again] Another key, I think, is the bottom of the order. That is where, it seemed, that the Phils had the greatest advantage. The depth of the lineup was so much stronger for the Phils than the Giants. But, so far, the bottom of the Giants order has highly outperformed their Philly counterparts. A lot of this falls on Raul Ibanez, who, when he is on, has to be one of the best #7 hitters in the game, but right now, he looks lost. With a still shaky J-Roll at #6 and Ibanez at #7, the Phils order, all of a sudden, looks more shallow than the puddle of a lineup that the Giants throw out there every night. 5:21: Well, just found out that Ben Francisco is in the lineup for Ibanez, so I guess it’s up to Francisco and company to come through at the bottom of the order. Oh, and for the record (and for reasons I don’t have time to elaborate on), the more I think about it, the more I agree with the Blanton decision tonight. 5:45: Yeah Bry, it looks like Charlie shares your concerns about the bottom of the order. I think putting Francisco in is a pretty good decision. He hit lefties really well this year (even though he’s barely played over the last couple months) and he gives some added range in the big AT&T Park outfield and some added speed on the base paths. Who Invited the NFL Quarterback? Don’t worry, there will be plenty of Phillies talk tonight (expect a live blog during the all-important Game Two), but right now, we need a quick word on the state of the Eagles after a highly impressive 31-17 victory over the Atlanta Falcons. Coming into this game, the Birds stood at 3-2 and first place in the NFC East, but there had not exactly been overwhelming signs that this team was really a contender…until today. Forgive me if I wasn’t impressed by wins over Detroit, Jacksonville, and San Francisco (though all were on the road and any road game in the NFL is tough), but in today’s win over Atlanta, the Eagles did look like a legit contender for another NFC East title. The most obvious reason for the excitement is that Kevin Kolb looked great. He continued his intelligent check-downs (for which he gets far too much criticism), but what he added this week was a downfield threat. He had deep touchdown passes to both major outside weapons, DeSean Jackson and Jeremy Maclin. And, as good as Kolb looked, he wasn’t the only one that stepped up in a big way today. I think the most impressive part of this game was the way the Eagles absolutely dominated the line of scrimmage on both sides of the ball. Coming into this game, the Eagles offensive line had been, by far, the most disappointing unit on the whole team. But, today, even with King Dunlop replacing Jason Peters at left tackle, the o-line was absolutely fantastic. There was a ton of room all day for LeSean McCoy and Kevin Kolb was given the necessary time to make the big plays. On the other side of the ball, the D-line kept pushing Atlanta’s line backwards, creating a frustrating day for Michael Turner and Matt Ryan. Trent Cole (the most underrated d-lineman in football) was all over the field today. And, with all the pressure on Matt Ryan, it enabled the secondary to continue to develop. Asante Samuel continues to be one of the best playmaking corners on the planet, and he even made a tackle of two today. But, the two guys that have consistently developed every week this year are the two safeties, Quentin Mikell and rookie Nate Allen. These two guys are really developing into a very, very good duo. And, finally, the special teams were highly improved. There were still a couple questionable kick coverages and three missed field goals, but the kick and punt return teams looked highly improved. The one sobering event of the day was the absolutely wicked (and totally clean) hit that Falcons safety Dunta Robinson put on DeSean Jackson in the second quarter. Jackson left the game with a very scary concussion and did not return. He will have to go through a battery of concussion tests just to get cleared to play this week, and it doesn’t look good, considering he had a serious head injury just a year ago. So, we’ll have to see how this all plays out. Fortunately, Jeremy Maclin is looking more and more like a pretty good #1A wide receiver in this offense and after the game this week against Tennessee, the Eagles have a bye week to get more healthy. “I promise you, we’ll have one of them out there,” he said, as the question inevitably arose. And, he finished the topic with, what I think, is the ultimate point (not so much the “chubby part”): “When you’re sitting here as a chubby coach in the National Football League and you’ve got two quarterbacks, you’re a happy guy.” That sums it up perfectly. Instead of focusing on who “should” play, let’s just be happy that we appear to have two legitimate NFL starting quarterbacks. Ask fans of Cleveland, San Francisco, Carolina or a handful of other NFL franchises what they would give for either of our guys. 2010 has been called the Year of the Pitcher, as the league-wide batting average was as low as its been since 1992 and there were 5 no-hitters. Well, if this was the Year of the Pitcher, then the NLCS will certainly be the Series of the Pitcher. As everyone knows, the Phillies-Giants series will match the two best starting rotations in the game. So, how do you beat great pitching? How can the Phillie offense, which has struggled at times against even the weakest pitching this season, manage even the few runs they’ll likely need to win the series? The answer, of course, is small ball. Many fans out there might cringe when they hear that phrase, or “pitcher’s duel,” but forget Sammy Sosa and Mark McGwire and the “perfect season” of 1998. Baseball is at its best when runs are few and far between, and anyone who disagrees with that is agreeing with Tim McCarver, so tread carefully. Baseball is a game of one-on-one battles and subtle strategy. So much of that strategy only really comes into play when teams need to use methods other than hitting the ball over the outfield fence to get runners around to home plate. And the one-on-one battles, every last pitch of every one of those battles, could mean the difference between a win and a loss. At this time of year, each one could be the difference between a championship and heart break, between a parade down Broad Street and another Tuesday spent in the office in front of a computer screen. How well is Rollins running? : Just about every strategy outlined below can include the caveat: “hopefully Jimmy is running well enough to help here”. So much of effective small ball is about speed, so the extent to which J-Roll can cut loose and run at full tilt will go a long way toward determing how much he can help in this series. He didn’t look great in the LDS, but there’s reason to hope that another five full days of rest could’ve really helped him. Run on Lincecum: Largely thanks to Davey Lopes, the Phils’ have been the best base-stealing team (percentage-wise) in baseball over the last few seasons. As we noted in our Giants preview, rookie catcher Buster Posey has been excellent at throwing out base-stealers. He played shortstop at Florida St., so you know he’s athletic and has a strong arm. However, Giant ace Tim Lincecum has never been good at holding runners. Even from the stretch, his long, unorthodox pitching motion means the ball takes an extra split-second to get to the plate, and runners have exploited that. Victorino, Utley, Werth, and Rollins have to be ready to take a bag, especially when Saturday’s game moves into the middle and late innings. Take the extra base on Burrell: No one knows better than the Phillies (and their fans) about Burrell’s limited mobility in left field. His arm is actually a bit under-rated because, while it’s not strong, it is very accurate. He threw out a lot of base-runners in his time in Philly because runners under-estimated him. BUT, his slow feet can be exploited. Any time a Phillie batter hits a bloop hit to Burrell’s right, they should be thinking double out of the box. Any time a runner is on first and there is a double into the left-field corner, they need to be scoring. The Giants know they’re sacrificing defense and speed for Burrell’s bat. The Phils’ need to make them pay for that decision. Hit-and-Run with Polanco: One of the main reasons the Phillies chose Polanco as their new third baseman was because of his incredible bat control and low strike-out rates, which is the type of hitter the Phillies needed in a very strike-out prone line-up. With the Phillies needing to manufacture runs in this series, and with Polanco struggling of late, they should take advantage of any opportunity to hit-and-run with him. After a sub-par September, Polanco had just one single in nine LDS at-bats. Many times a slumping hitter can benefit from the hit-and-run because it gets them to stop thinking too much and just make sure they put the bat on the ball. Few players put the bat on the ball as frequently as Polanco, and if Victorino is standing on first base, Charlie would be wise to put on the hit-and-run play. Move the runners! : This is something that players should always be focused on, but it takes on an added importance in this series. Every player needs to focus on hitting the ball to the right-side with a man on second and no outs. Runners on third with less than two outs have to be driven in. Runners need to be locked in and focused at all times, taking third base on deep fly balls, or even second base if Burrell makes a catch in the left-field corner. Small ball is back, and it’s a beautiful thing, but only if it’s done right. The team that does it better may well be the one headed to the Fall Classic. When the Phillies return to action on Saturday, for Game 1 of the NLCS, they’ll be taking a big step up in competition from the Reds to the Giants. At the risk of beating a dead horse, you win with pitching in the postseason, and the Giants clearly have the only group of starting pitchers in baseball that can match-up with the Phillies. Objective baseball fans across the country should be thrilled with the pitching match-ups they’ll get to see every single night in this series. The Giants are a storied franchise, as they were one of the original teams into the league in the 1880’s and they’ve had plenty of success throughout their history. Legendary manager John McGraw led them to 9 NL pennants (and 3 World Series titles) in the early-1900’s. They won two more World Championships, including one led by Willie Mays and another legendary manager, Leo Durocher, in 1954, before leaving New York City behind and moving out to Northern California in 1958. In their time in San Fran, they’ve had periods of decent success. 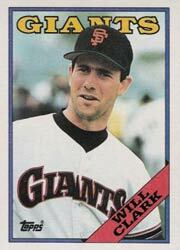 There were the late-80’s teams led by Will “The Thrill” Clark and, of course, the Barry Bonds era in the late-90’s/early-00’s that produced a string of 8 straight years where they finished 1st or 2nd in their division. But the Giants have yet to capture another title since their move out west, a 56-year drought that is surely starting to wear on some of the older Giant die-hards. They return to the postseason this year for the first time since 2003, since that Bonds era ended, and I wouldn’t be the first one to point out the irony of them being led into this NLCS by a 5-foot-nothing, 160-pound, 26-year-old pitcher, with a laid-back personality (Lincecum), rather than a surly veteran with such a grotesquely altered physique that steroid rumors hung over him like a dark cloud for the last five years of his career. To preview this 2010 edition of the Gigantes, we’ll go through their team player-by-player, like we did for the Reds last week, and break out the old Momentum Meter once again to see which Giants are coming in hot, and who’s scuffling, based on a 1-5 rating. 1. Andres Torres- CF: .268/.343/.479, 16 HR, 26 SB. This 32-year-old seemingly came out of nowhere to have an excellent season and take the CF job away from Aaron Rowand. After very brief stints in the majors early in the decade, he spent all of ’06-’08 in the minors. Apparently during that time he began taking medication for ADHD. Whether that’s the reason or not, he returned to the majors last year and was productive in 150 AB’s before his breakout season this year. A switch-hitter that is far better from the left-side. Momentum Meter: 1. He’s hit well below the Mendoza Line since September 1st, and that’s not including his 2 for 16 showing in the NLDS. Might we see our old friend Rowand if his struggles continue? 2. Freddy Sanchez- 2B: .292/.342/.397, 7 HR, 47 RBI. Very much in the Placido Polanco mold, he’s a 3-time All-Star and won the batting title in 2006. Not quite the defensive player that Polanco is, but still solid at second. Momentum Meter: 4. Also was 2 for 16 against Atlanta, but he hit .333, with 6 of his 7 homers, in August and September. 3. Aubrey Huff- 1B: .290/.385/.506, 26 HR, 86 RBI. This unfortunately-named first baseman has had an under-rated career, but its been under-rated because he’s been unable to find consistency from year-to-year. He had a good one this year and he’s one of the main reasons the Giants find themselves back in the playoffs. He’s a lefty but has handled left-handed pitching well this year, including a big hit off a lefty in Game 3 of the LDS. Still, Charlie will look to put Romero on him if the situation presents itself. 4. Buster Posey– C: Make no mistake: this rookie is the best hitter in the Giant line-up. I saw him play in SF in his second game after being called up in late-May, and he had 3 hits, after also picking up 3 hits in his debut the day before. He’s a natural born hitter, with great command of the strike zone and the strength to hit the ball out when he gets a strike. He’s also thrown a very solid 37% of would-be base-stealers. Momentum Meter: 4. 8 home runs since September 1st (though his average dipped) and 6 hits in 16 LDS AB’s. 5. Pat Burrell– LF: .252/.348/.469, 20 HR, 64 RBI. In the LDS, the Phils faced the most hated former Phillie (Rolen), and now they’ll face the most beloved former Phil, Pat the Bat. I fully expect him to get a big applause in his first AB on Saturday. Much has been made of Pat’s struggles since he left Philly, but since the Giants acquired him in June, he’s basically been the same hitter he was in his last couple of years in Philly. That may not sound overly impressive, but he was the 5-hitter for our title team in ’08. He’s slugging .509 in close to 300 AB’s with SF. Of course, with two more years of age added to his legs, it will be interesting to see how he fairs in left field and on the base paths. Momentum Meter: 4. 13 homers since August 1st, including a 3-run shot in the LDS. 6. Juan Uribe– SS: .248/.310/.440, 24 HR, 85 RBI. One of the fattest shortstops you’ll ever see and, no, that doesn’t do him any good defensively. With the bat, he likes to put that weight to good use and swing for the fences, which helped him achieve career-highs in HR and RBI this year. All in all, not a very good player, but I think the Giants feel like they need all the run production they can get in there. Momentum Meter: 2. His batting average has been plummeting throughout the season, culminating with just one hit in the LDS. Capable of hitting one out at any time though. 7. Mike Fontenot– 3B: .283/.331/.375, 1 HR, 25 RBI. Hard to say if it will be Fontenot or Pablo Sandoval here, but it looks like Fontenot may have taken the job. Sandoval has had a hugely disappointing season, after being the Giants best hitter by far in ’09, and Fontenot is a huge upgrade defensively. I think the Giants would be smart to go with Fontenot here, because every run will be so important in this series. Adding a better glove and some more speed to the line-up can only help. 8. Cody Ross- RF: .269/.322/.413, 14 HR, 9 SB. Just acquired from the Marlins in late-August. Installing him as the right fielder is another sign (along with Fontenot at third) that the Giants are trying to address their defensive shortcomings. Ross has mostly been a CF in his career, so he has above-average range for a RF. Jose Guillen could also get a shot in RF during this series, with Ross possibly moving to CF for the games started by Hamels. Momentum Meter: 4. He’s proven himself to be a capable hitter over the last couple years in Florida. He was struggling a bit this year but he’s been rejuvenated by the move to SF, and he delivered a couple big hits in the LDS. Tim Lincecum: 16-10, 3.43 ERA, 1.27 WHIP, 212 IP. Do you think somewhere Jevon Kearse is bitter that another athlete stole his “The Freak” nickname? Or is he just bitter in general about his whole career? Anyway, this was Lincecum’s third full season in the majors, and the first two both ended with Cy Young Awards. This season will not end that way, as Lincecum had much-publicized struggles throughout the year, culminating in an August that saw him go 0-5 with a 7.82 ERA. It definitely looks like he’s identified and corrected whatever issue he was having, and he’s been throwing as well as ever since early-September, which is really bad news for opponents. Since August, he’s thrown less fastballs and relied more on his devastating change-up and other off-speed pitches. Momentum Meter: 5. 6-1, with a sub-2 ERA since the start of September, plus a 2-hit shutout in Game 1 of the LDS. Matt Cain: 13-11, 3.14 ERA, 1.08 WHIP, 223 IP. He’s always been overshadowed by Lincecum, but the 26-year-old Alabaman is also one of the best young pitchers in the game. The best pitch for this powerfully-built, workhorse is his fastball, but he also has a plus change-up along with curve and slider. Jonathan Sanchez: 13-9, 3.07 ERA, 1.23 WHIP, 193 IP. His potential was obvious for a few years before he really improved his control this year and had a great season. He still has the ability to get wild, but he has “swing-and-miss” stuff, as they say. If his control is there, he’s very difficult to hit. Allowed 2 runs in 13 innings vs. the Phils this year. He throws fastball, slider, change-up. Momentum Meter: 5. 1.06 ERA in his last 8 starts, including Game 3 of the LDS. Madison Bumgarner: 7-6, 3.00 ERA, 1.31 WHIP, 111 IP. 21-year-old rookie was the 10th overall pick out of high school in ’07. A really impressive rookie campaign and showed a lot of poise in his postseason debut on Monday night. He’ll almost certainly start Game 4 of this series. Momentum Meter: 5. Like every other Giants starter, he’s coming in hot, with a 1.43 ERA in his last 7 starts. Brian Wilson- Closer: 1.81 ERA, 1.18 WHIP, 48 saves, 74 IP. Arguably the best closer in the NL this year, as he led the league in saves to go with his sparkling ERA. He’s sporting a pretty gnaryly beard for the playoffs. Relies on a mid- to high-90’s fastball and a good cutter. Momentum Meter: 5. Four earned runs allowed in his last 32 IP, including 4 shutout innings in the LDS. Santiago Casilla– RHP: 1.95 ERA, 1.19 WHIP, 55 IP. 30-year-old spent the last few seasons as a mediocre reliever for the A’s, but the move across the bay apparently did wonders for him. Looking at the numbers for all these Giant pitchers, you have to think pitching coach Dave Righetti must be doing a fantastic job. High-90’s fastball, with slider and curve. Momentum Meter: 5. A 1.13 ERA over the last two months of the regular season. 1.2 scoreless innings in his lone appearance of the LDS. May have replaced Sergio Romo as the main set-up man. Sergio Romo- RHP: 2.18 ERA, 0.97 WHIP, 62 IP. 3rd-year California-native emerged as a very good 8th-inning set-up man this year. Relies on a really good, sweeping slider that is very tough on right-handed hitters. Momentum Meter: 2. Came into the playoffs pitching well, but two poor outings in the LDS may have cost him his 8th inning job, especially considering he’s more effective against righties and the Phils have a lot of lefty bats. Javier Lopez- LHP: 2.34 ERA, 1.21 WHIP, 58 IP. Veteran lefty spent the last few seasons in Boston and came to the Giants in a trade deadline deal with the Pirates this year. Lefties hit .162 off him this year. He’ll be their go-to guy for Utley, Howard, and Ibanez. Momentum Meter: 5. Has a 1.42 ERA in his 19 innings since the Giants acquired him. Ramon Ramirez- RHP: 2.99 ERA, 1.14 WHIP, 69 IP. Also acquried at the trade deadline, he came over from the Red Sox. Features a mid-90’s fastball and a good, power slider. Momentum Meter: 5. Allowed a ridiculous 2 earned runs in 27 innings after the trade. Maybe another successful reclamation by Righetti. He did surrender a run in 2 innings in the LDS. 10:00 PM: OK, I’m starting this Live Blog late because there was just too much to watch with the Phils and Eagles playing at the same time. But now, the Eagles game is at the half, and the Phils game is just slightly past the halfway point, so I’m ready to start this up. Both teams have leads right now, but neither is running away with the game. The Phils lead 2-0 in the 6th and the Birds lead 17-10. I didn’t see all that much of the Eagles 1st half, but it looks like it’s been somewhat surprising in that both quarterbacks have had efficient and poised games so far. Alex Smith did throw a pick, but he completed 11 of 16 passes. Kolb was even better, hitting on 12 of 14 passes and a touchdown. Not surprisingly, Jason Peters and Broderick Bunkley have gone down with injuries. As for the Phils, they need 12 more outs to put the Reds away and move on the NLCS. Hamels has thrown just 61 pitches through 5 innings and been in total control throughout. There’s no reason why he shouldn’t be able to handle at least 9 of these 12 outs, but you never know if he might run into some trouble at some point. So, let’s see if our boys can hang on to these leads here! 10:05 PM: The Phillies may very well be on their way to a sweep here, but the question marks around the offense that we had coming into the playoffs still remain. They were shut down in Game 1 after Volquez left the game in the 2nd inning, they were basically handed a bunch of the runs they got in Game 2, and they’ve only managed one earned run through 6 innings tonight. The pitching has been exactly what we expected, but if the offense can’t get runs on this Cincy pitching staff, how will they score on the Giants or Braves staffs? 10:20 PM: Hamels’s dominance of the Reds in his career is uncanny. Not only has he dominated them, but he also made his major league debut against them in ’06 and then pitched his first complete game against them the following year (along with 15 K’s in that game). If the Phils can hold on tonight, he’ll add a dominating post-season start to his list of accomplishments vs. the Reds, and all three of those big games came on the road in Cincy. I guess Charlie and Dubee knew what they were doing when they chose Cole for Game 3. 10:28 PM: Hamels shows his first signs of tiring in the 7th, but escapes without giving up a run. Hernandez doubles for the Reds’ first extra-base hit of the night, and Gomes and Bruce both put good wood on the ball, but they hit them right at Phillie outfielders. I think Hamels will come out for the 8th, but I’m sure Madson will be ready, and he’ll be on a short leash. The Eagles subsequently fail to convert a 4th down from the 30-yard-line. Why no field goal there? I haven’t been watching closely enough, but maybe the wind in San Fran is kicking up too much? 10:48 PM: Cole puts them down in order in the 8th. The play-by-play man mentioned that his change-up has been a “money pitch for him tonight.” Yes, tonight, this year, and for most of his life that’s what that change-up has been. Literally, he has made (and will make) lots and lots of money in his life thanks to that pitch. 10:52 PM: After a missed David Akers field goal, Alex Smith fumbles the ball and Quintin Mikell runs it back 50 yards for a score! Absolutely huge play in this game, as the Birds take a two touchdown lead. 10:56 PM: Carlos Ruiz just hit a 105 MPH fastball for a double!? That’s impressive, and pretty cool. Hamels, at 106 pitches, is hitting for himself and will come out for the 9th inning. I’m ok with that, but I would’ve been ok with pulling him here too, especially with a man in scoring position. But the way he cruised through that 8th inning, after a somewhat shaky 7th, is enough to leave him in there. 11:03 PM: Man, hard to believe that Mike Singletary will be coaching the Niners for much longer, as he engages with a pretty heated conversation/argument/confrontation with Alex Smith on the sideline. Smith has just two completions in the 2nd half, but I fail to see how you’re helping your team, as a coach, by shouting so much at your quarterback in the middle of the game. Alright, let’s go Cole! 11:19 PM: PHILS WIN!!! The beat goes on, as the Phils move on to their third straight NLCS, and they’ll go looking for the NL three-peat. What a great way to end the series, as Hamels twirls a 5-hit shutout and ends it by striking out Scott Rolen. That was strike out numer EIGHT for Rolen in the series, in eleven AB’s. Imagine if you had told Dusty Baker before the series that his team would give up just 8 earned runs in the entire series. With the league’s top offense, he would’ve had a hard time believing that 8 earned runs would be enough to sweep his team, but that’s what happened. The Phils have now won 6 series over the last three Octobers, but this is their first sweep. The Reds weren’t ready for this challenge, and their 6 errors are the best evidence of that. But, to the surprise of absolutely no one, the Phillie starting pitching is capable of beating just about anyone. The Phils will now have 5 days of rest before Halladay returns to the mound at the Bank on Saturday against either the Giants or Braves. Meanwhile, the Niners got a touchdown but Akers just hit a field goal to make it 27-17 with 4:30 to go. It’s still not over yet, as the Niner offense continues to show signs of life. Time for this Eagle defense to step up and put this game on ice. 11:21 PM: The Niners return the kickoff 61 yards. Hey Andy, can you PLEASE fire Bobby April as special teams coach tomorrow? There’s nothing more frustrating than that as a football fan. It’s like a basketball team that can’t make free throws. 11:31 PM: Arrrghhh. The defense has a chance to step up, and they do the exact opposite, as a very mediocre offense just goes through them like they weren’t even there and puts another touchdown on the board. Birds need to pick up a first down, run out this clock, and keep the defense from coming back on the field. 11:34 PM: Wow, LeSean McCoy had a chance to end the game and just slides. I’m almost positive he just thought he was past the marker already and thats why he slid. That’s still not acceptable, but its better than just sliding to avoid contact, knowing that you’re short of the yard marker. This is NOT good. 11:43 PM: EAGLES WIN!!! They end it with another pick, as the turnover battle was probably the key to this win. The Eagles force 5 San Fran turnovers and only turn it over once themselves. The game-clinching interception was actually thanks to the pressure by Trevor Laws that forced a bad throw from Smith. Laws has been great as a backup tackle. The Eagle season is temporarily back on track after this road win. Back home for the Falcons next week. 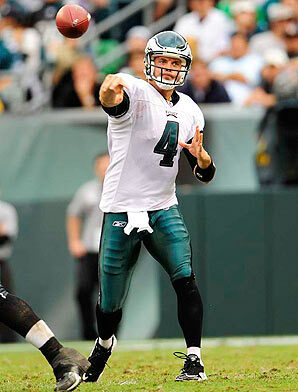 Get ready for a week of quarterback speculation regarding the health of Vick and the solid performance of Kolb. -Polanco’s back is obviously feeling better, as he’s back in his customary 2-spot. Good news. -I love leaving Victorino in the lead-off spot. He’s now the Phillies all-time leader in post-season hits (35) and J-Roll isn’t running at 100%. -Which brings me to the thing I don’t understand about this line-up: why is Rollins hitting ahead of Ibanez? Ibanez has been one the Phils’ hottest hitters, and Rollins has barely played over the last month. When Rollins has played this year, he’s been mostly ineffective. The Inquirer’s Matt Gelb pointed out that Rollins is 4 for 12 with a homer off Arroyo in his career, but is that really enough to bump him ahead of Ibanez? The only theory I can think of is that Charlie wants to get Ibanez a bit further away from the other two lefties, but isn’t the presence of Jayson Werth between Howard and Ibanez enough to take care of that? I don’t really get it. I trust in Charlie, and this isn’t a huge deal or anything, but it seems like a mistake. Roy Halladay threw a no-hitter in Game One of the NLDS yesterday…woooooooooooooooooooooo! 5:34 PM: Alright, getting a bit of late start on this live blog, but I’m now fully settled in. Roy Halladay has gone through the first two innings effortlessly, inducing four grounball outs. Nice to see the Phils manufacture a run, with Victorino stealing third and Utley getting him home on a sac fly. It’s great to get an early run on the inexperienced Volquez. He’s the kind of guy that would most likely gain confidence as the game went along if he was shutting them down. 5:39 PM: Obviously the big news prior to the game was that Polanco is out with a sore back. Pretty bad news. I don’t like how it threw the team for a loop, psychologically, right before the start of the playoffs. As for the tangible results, Rollins is at the top of the order, and Wilson Valdez takes over at third and hits 8th. Valdez makes just his 4th start of the year at third (and 8th of his career) so there is a tiny bit of concern there, but he certainly has the tools to be a really good defensive third baseman. Polanco, of course, is a masterful #2 hitter that contributes offensively in so many ways that you just don’t get with Rollins and Victorino up there. But Jimmy and Shane certainly bring their own tools, as we saw with Shane stealing third in the 1st. What we’ll get from Rollins is the bigger question. 5:46 PM: RBI from Halladay!! Well, if Volquez wasn’t rattled already, he has to be now. A two-out RBI surrendered to the pitcher, wow. And it was set-up by a surprising mental mistake by veteran SS Orlando Cabrera, who seemingly had a play on Valdez at 1st but tried for second and couldn’t get the ball there on the previous play. If the Reds want to win this series, these are the exact kind of things they can’t afford, especially from their veterans. Bullpen activity here in the 2nd for Cincy. 5:56 PM: Well, we said Volquez was a high risk/high reward choice by the Reds, and it pretty much blew up in their faces. He was working from behind in the count the whole time he was out there, which turned out to be just 1.2 innings, as he follows the Halladay single with a walk to Rollins and 2-run single to Victorino. 4-0 Phils! Hey, remember how good Victorino is in the playoffs? I’d almost forgotten. Man, this team is tough this time of year. 6:00 PM: Hopefully Halladay isn’t thrown off by that long inning and having to run the bases. I doubt it, but I guess you never know. 6:13 PM: This is certainly not the most logical time to give some criticism to Ruben Amaro, but I’ll do it anyway. I supported the Polanco signing, and I love the guy, but I did say on this blog in the off-season that I thought Adrian Beltre was the best option on the market. All Beltre did with Boston this year was hit .321 with 28 homers, and an AL-leading 49 doubles, while playing a Gold Glove-caliber third base. He also did all of that for just a one year/$9 million contract, which is less than Polanco made this year in the first year of 3-year deal. “Sore back” is an old man injury, and Beltre is four years younger than Placido. Also, it would be a lot easier to stomach letting Jayson Werth walk if we had a power right-handed bat like Beltre in tow. So, in sum, the Polanco signing was a nice one, but that doesn’t mean it was the best choice. That’s all done with now, but seemed worth mentioning today. 6:23 PM: I just don’t even know what to say about Halladay anymore. He’s an absolute master. He’s like Greg Maddux, only with 5 more MPH on his fastball. He throws like 5 different pitches, and that’s not including like 3 different fastballs. Every single pitch has late movement, and he has complete command over every one of them. 12 for 12 on first-pitch strikes, and he’s perfect through 4 innings, against the top offense in the NL. 6:35 PM: Our old friend Cliff Lee beat the Rays today, going 7 innings, 1 run, with 10 strike outs. We’ve gotten to watch some fairly decent pitching over the last couple years, huh? 6:48 PM: Bry’s comment below: “This Travis Wood guy really gives the Phillies fits. Didn’t he take a no-hitter into the 9th inning against us in the regular season?”. Yeah, I think he did. A lot of people thought the Reds should’ve had him in the rotation for this series. Looks like they made a mistake there, but I guess he could very well start Game 4, if there is one. 6:56 PM: Another unforced error by the Reds, as reliever Logan Ondrusek fires the ball way over the head of Votto and Ibanez gets to second on the two-base error. Looks like some nerves there for the rookie. I’m guessing he didn’t experience anything like the Bank in a playoff game this year, or in his life. Let’s see if the Phils can capitalize again. 6:58 PM: In case you’re wondering: 69 pitches for Halladay through 6 innings. So, the complete game is very much in play, even if the no-no is lost. 7:07 PM: Wow, Joey Votto playing some mind games with Halladay and stepping out on him late twice in this at-bat. First of all, Joey, if you’re the NL MVP, act like it. You shouldn’t need some weak nonsense like that. Second of all, this isn’t Edinson Volquez or some pitcher you’re used to seeing, this is Roy Halladay. He’s barely human. 7:35 PM: Oh my god, oh my god, oh my god. 7:45 PM: Well, folks, numerous times in my life my grandfather told me about the day in 1956 that he spent in a hospital in New York City after breaking his arm playing Gaelic football. He was listening to the World Series on the radio, and a guy named Don Larsen threw a perfect game for the Yankees. Roy Halladay has just become the second pitcher to ever throw a no-hitter in the playoffs, and I’m guessing we’ll all be telling people about it 50 years from now that aren’t even born yet. It wasn’t a World Series game, but it was a Phillie, so the story will loom just as large for us. And Don Larsen was an average career pitcher who had the day of his life. Halladay is a future Hall-of-Famer, at the peak of his powers. He waited his whole life to pitch a playoff game, and eleven years as a major leaguer. To go out and not only pitch well in the biggest game of your life, but to pitch as well as you ever have, which is about as well as any pitcher ever has in the history of this game, is just incredible. What can we even say? Better writers than me will put this in its context in the coming days. What a game for Halladay and for the Phillies and for us fans. What this means going forward: Halladay has put his September doldrums far behind him. The extra rest seems to have served him well. We rode Cole Hamels in ’08, Cliff Lee in ’09, and hopefully Halladay this year, with two pretty decent guys backing him up. They’ll be a tough out. As for this series, the Reds just experienced the feeling of being out-classed in pretty much every way. They surely realize now: they’re dealing with the best, and they need to step up their game, eliminate the fielding errors, throw strikes, and get the bat on the ball if they want to have a chance in this series. 7:47 PM: Some fans had some shirts referencing the “Double Rainbow” guy. I feel like that guy after watching that performance. The first thing Roy does in his interview is give credit to Carlos. What a guy. What a pitcher. Amazing.